UPDATE: Historic Ellicott City experienced yet another devastating flood on 5-27-18 following one on 7-31-16, causing even more damage. Please be aware that the following travel guide was written pre-floods and that some shops and restaurants might not re-open. The Getaway Mavens offer thoughts and prayers to those effected, and hope that this charming town will once again rebuild and recover quickly. WHY GO: Old Ellicott City MD, a former mill town, has been ahead of its time and on the forefront of reinvention for several decades now. You’ll feel as if you’re in another world as you descend down into town from the ridge above, when all of a sudden, the rough hewn granite buildings of curved Main Street heave into view. Here there be ghosts – the B&O’s first railroad station, a National Road milepost, the ruins of an 1800’s girls finishing school – and fantastic shopping in some of the region’s first repurposed buildings. Stay in a stunning 1780 Inn, and in nearby Columbia MD – a Rouse Co.’s 1960’s planned community – visit one of architect Frank Gehry’s first commissions, now a Whole Foods Grocery and Healing Center. 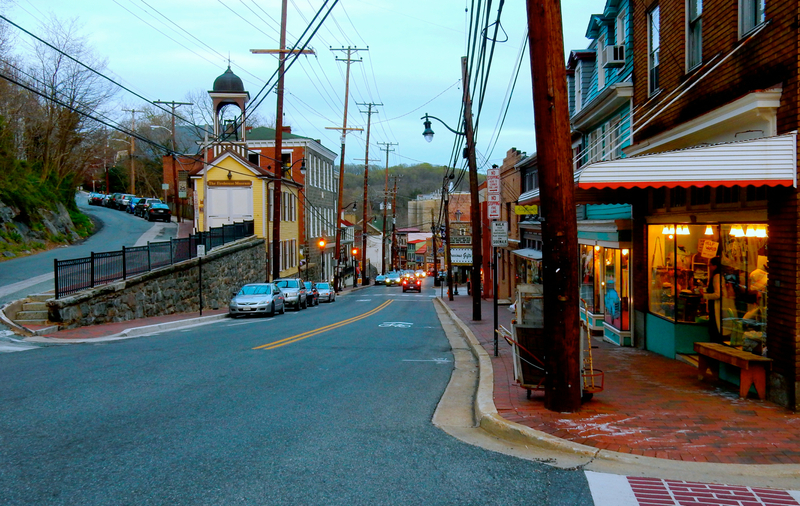 Just 13 miles from Baltimore, Ellicott City is a uniquely pleasurable getaway. 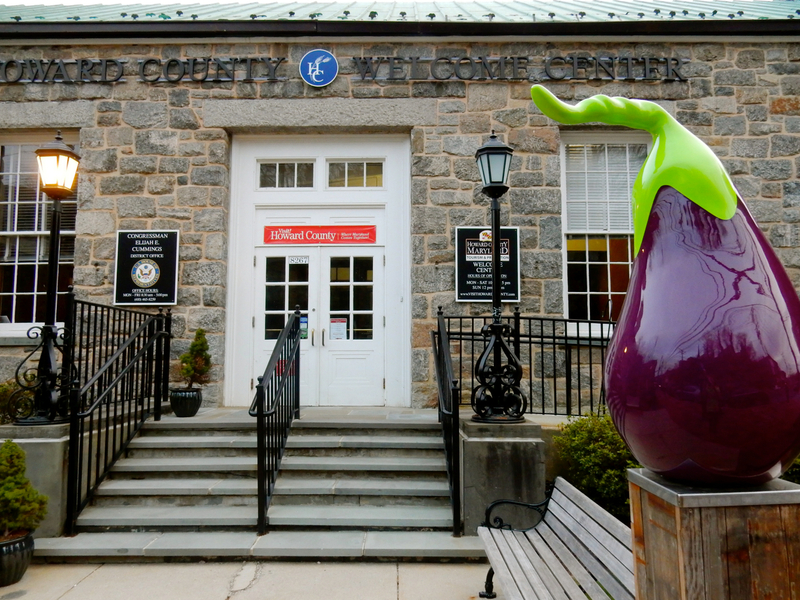 GO: Howard County Visitor Center, Historic Ellicott City. 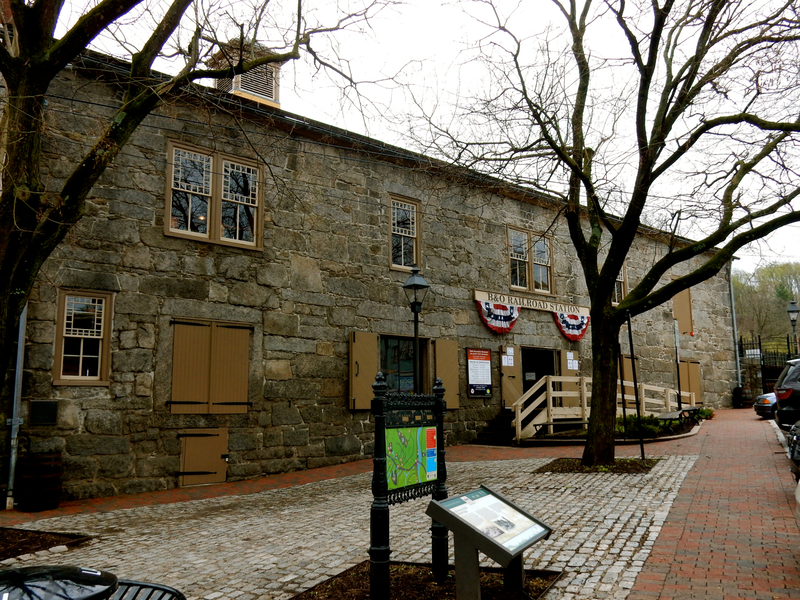 History is preserved in Ellicott City’s Post Office turned Visitor’s Center. You can still see the 1940’s wall murals, the original Post Office vestibule, green marble walls, hefty iron safe, and P.O. Boxes now filled with gifts! Come in, pick a number and open the corresponding P.O Box for yours! 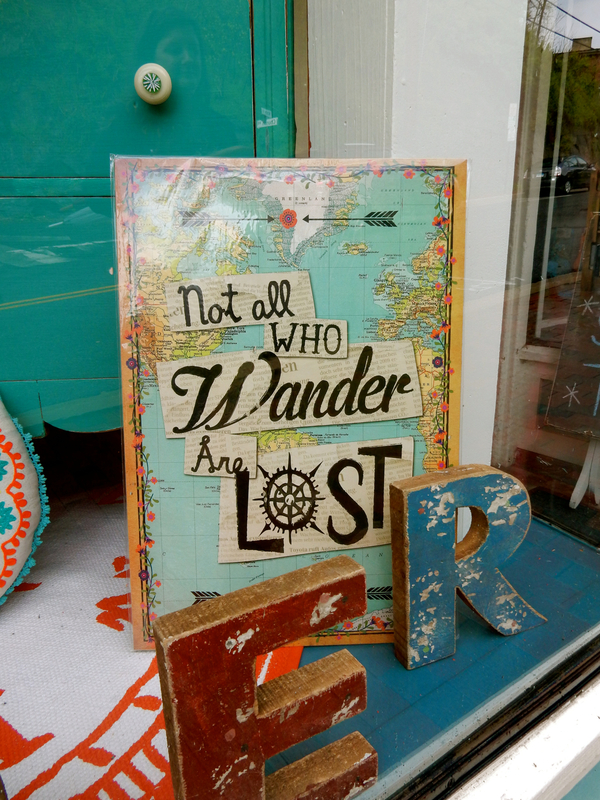 It’s a great first stop before you take off on foot to shop in quirky, one of a kind shops, and peruse offbeat museums. Don’t forget to take a selfie with the Pink Gingerbread Girl – a remnant from the Enchanted Forest that thrilled little ones in Ellicott City from the 50’s – 80’s. Open Mon-Sat 10-5, Sun 12-5, free. TOUR: Patapsco Female Institute. 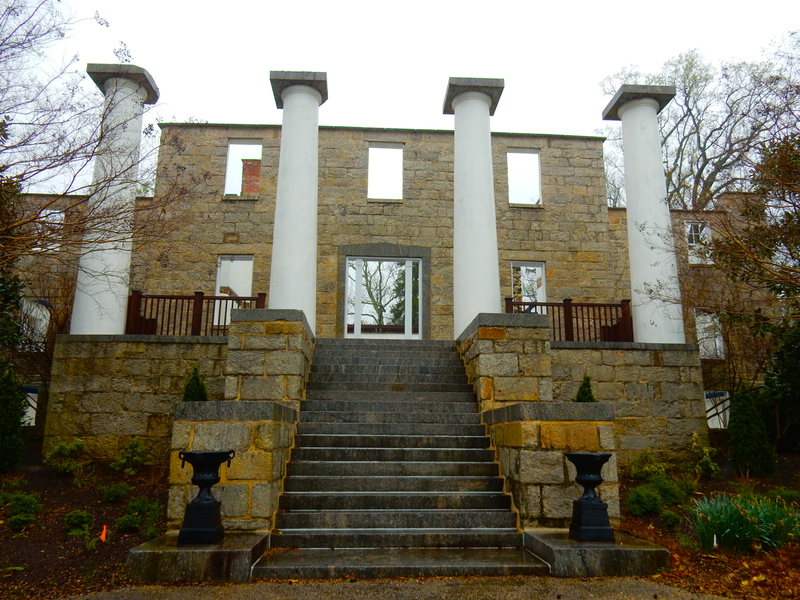 Now just stabilized ruins, this 1837 finishing school for girls ages 12-18 sat majestically atop a hill overlooking the mill town below. It was progressive for the early 1800’s, but though the school’s demise and physical deterioration could be documented over time, much of the building’s use and history remains a mystery, which in itself is mysterious. This much is known. The Female Institute expanded greatly in size and reputation between 1841-1855 when the twice-married (once widowed) Elmira Hart Lincoln Phelps was Headmaster. Lincoln-Phelps believed that women should be schooled both in the finer “women’s” arts and in the tougher sciences, with a focus on Botany. The student body drew mostly from the Southern States, as there was a convenient railway station – the first of the Baltimore & Ohio Railroad – at the base of the hill. During the Civil War, Southern parents feared for their daughters’ safety, and enrollment declined. The school shuttered in 1891, and the building was briefly turned into a summer hotel until being purchased as a private mansion in 1905. Since then, the structure was a hospital (during WWI), and a condemned nursing home, until finally it was abandoned and left to decay. 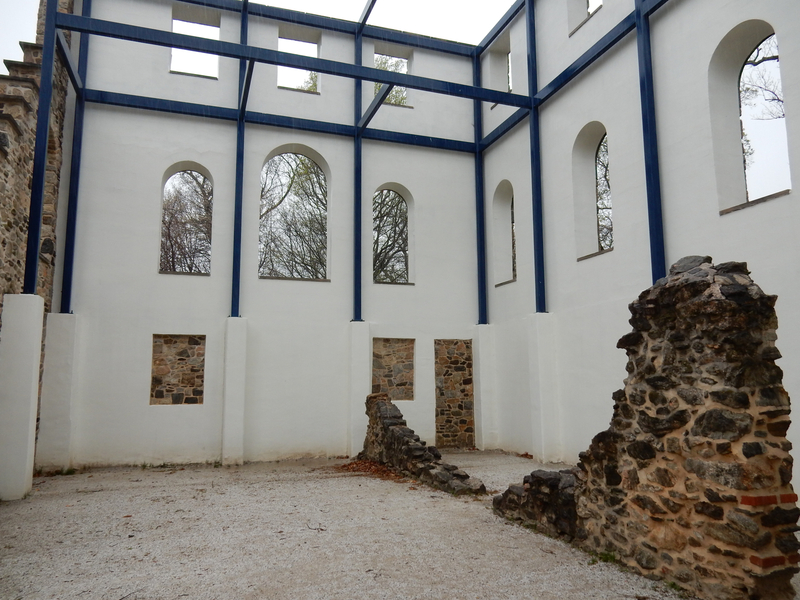 There are some documents, archeological finds, and at least one student journal discovered recently, providing glimpses into the ruin’s first iteration as a Girls School. But for the most part, tour guides and historians can only surmise about the day-to-day life at Patapsco Female Institute. (Here’s a call to those with ancestors who attended this school; look for notes and letters that they were required to send home you might find stashed among old papers. 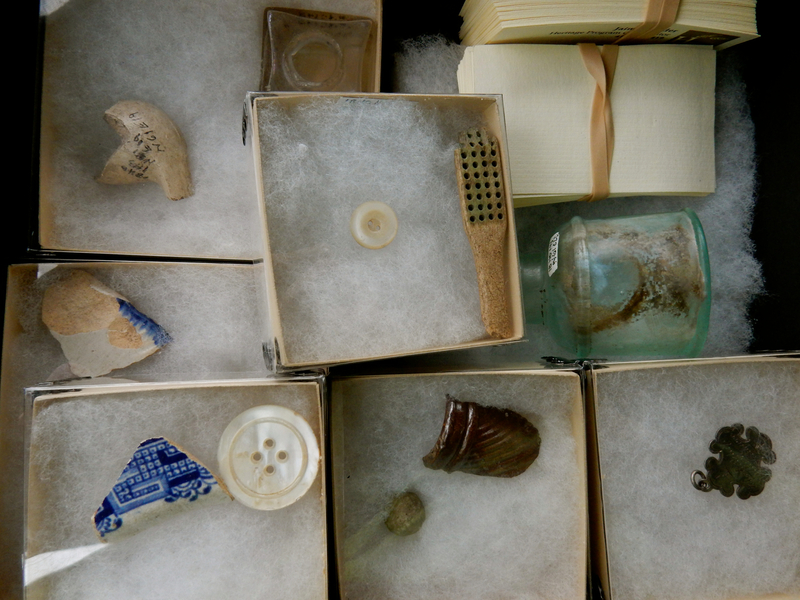 These would be extraordinarily important to Ellicott City historians, so check your attics!). Tours on weekends at 1:30 and by appointment, contact Howard County Visitors Center for information. 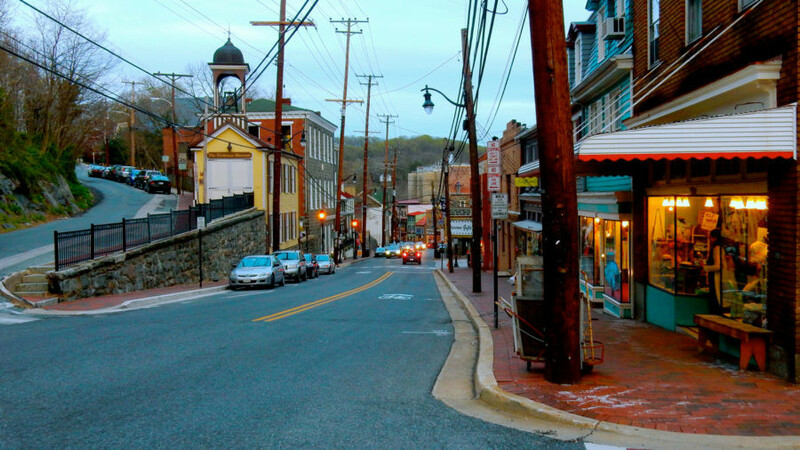 TOUR: Ye Haunted History of Olde Ellicott City Ghost Tours Parts I and II. 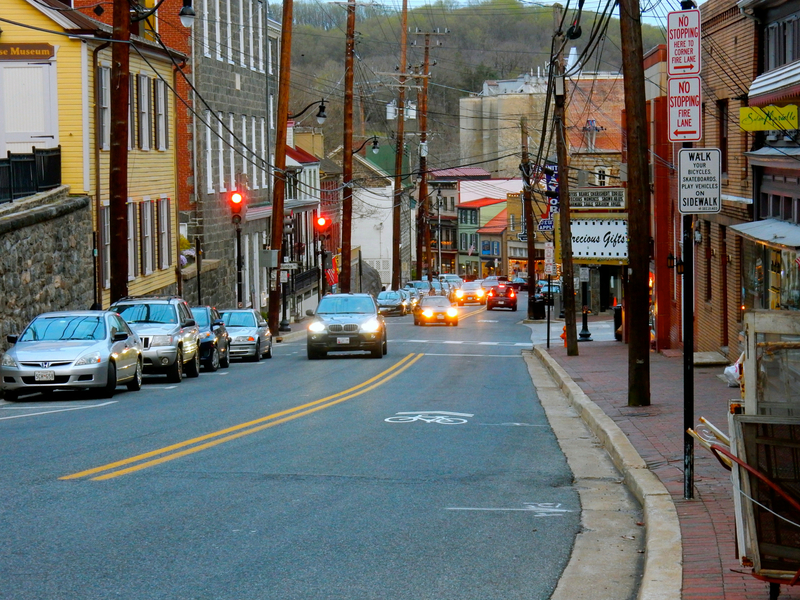 “They” say that Ellicott City is one of the most haunted towns in the USA. Learn about spooky goings on and unusual occurrences on these very fun walking tours. $13, April – November, Fri and Sat 8:30pm. 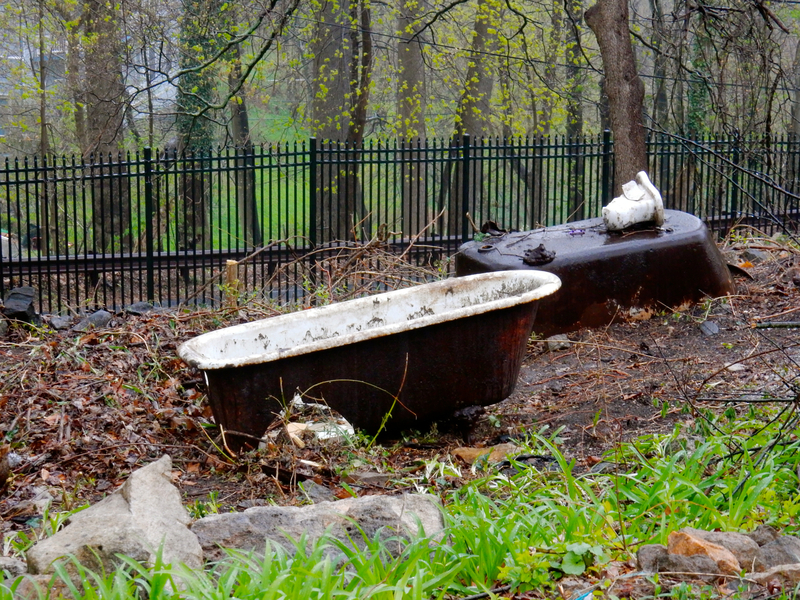 Journey From Junk – for vintage and upcycled clothing and furnishings. 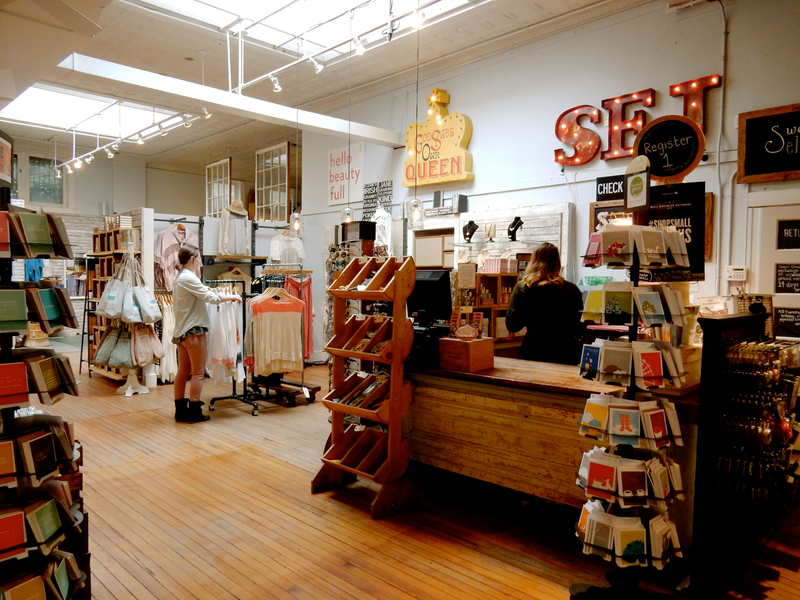 Sweet Elizabeth Jane (in the former Caplan’s Department Store) – for innovative housewares, soaps, clothing, pillows, and tools you never knew existed. Cotton Duck Art and Apparel – for owner-designed graphic t-shirts. 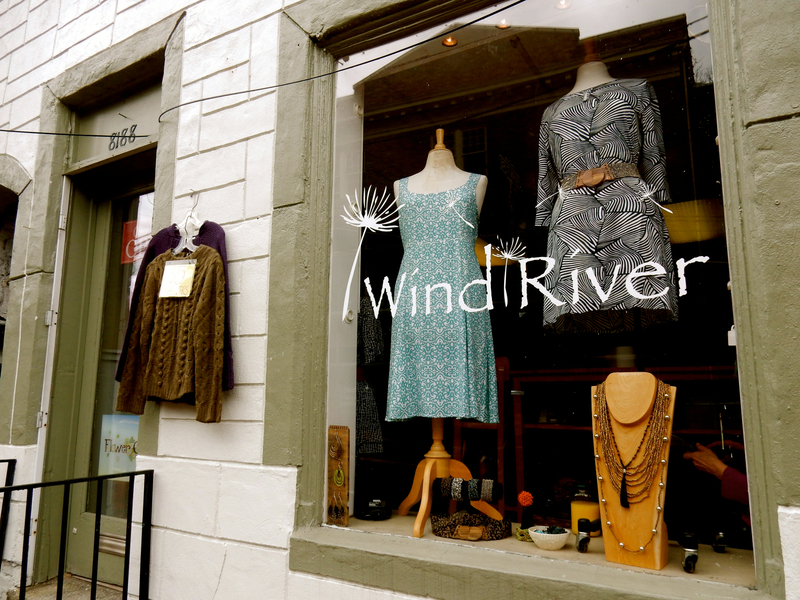 Wind River Outlet – yes, the owner/founder of Wind River lives right here in Ellicott City, and oh my gosh, most items in the store are $5 and $10. A little known secret. VISIT: B&O Railway Museum, Ellicott City Station. At the bottom of Main Street, this is the original terminus of the first 13-mile commercial railroad in the country with its original 1830 depot still standing and well preserved. $8, open Wed-Sun 11-3:30. PHOTO OP: National Road Marker. 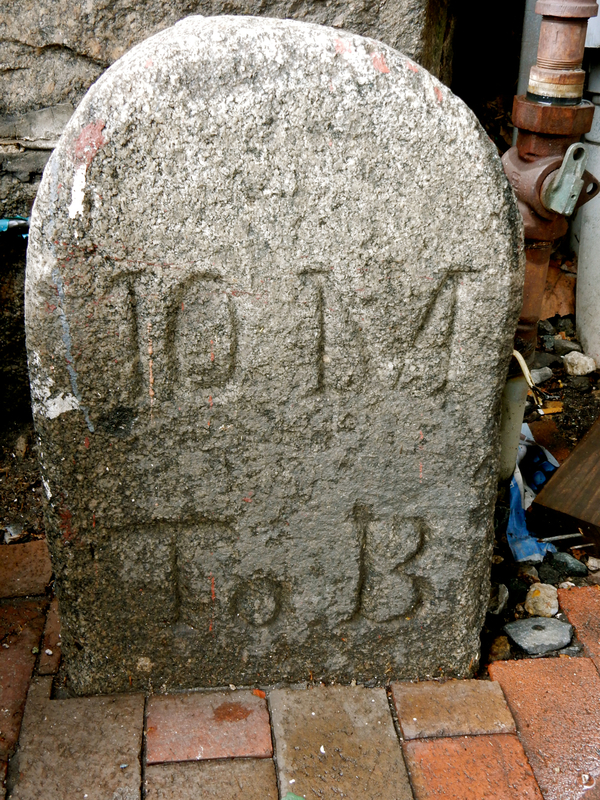 You’ll find this mile-marker on the corner at the bottom of Main St, across from the B&O Railroad Museum and in front of a shop. “10 M to B” – clear as day. 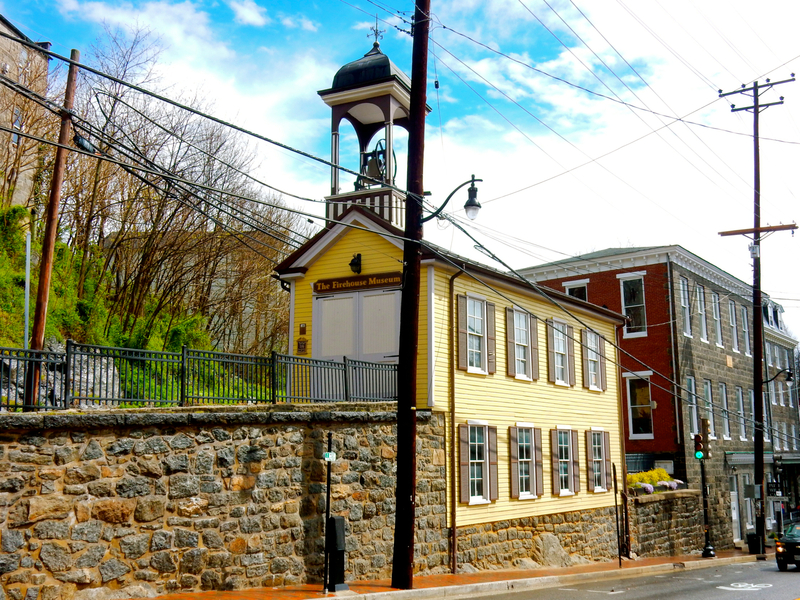 VISIT: Ellicott City Firehouse Museum. Wedged on a sliver of land between Main and Church St., Howard County’s first Firehouse now houses artifacts and toys from firefighting days gone by. Open Sat, Sun 1-4, April-Dec.
DO: R&R at Haven on the Lake, Columbia. A retreat for mind and body, this day-spa is located in a building designed by one of the most famous modern architects of our day – Frank Gehry. 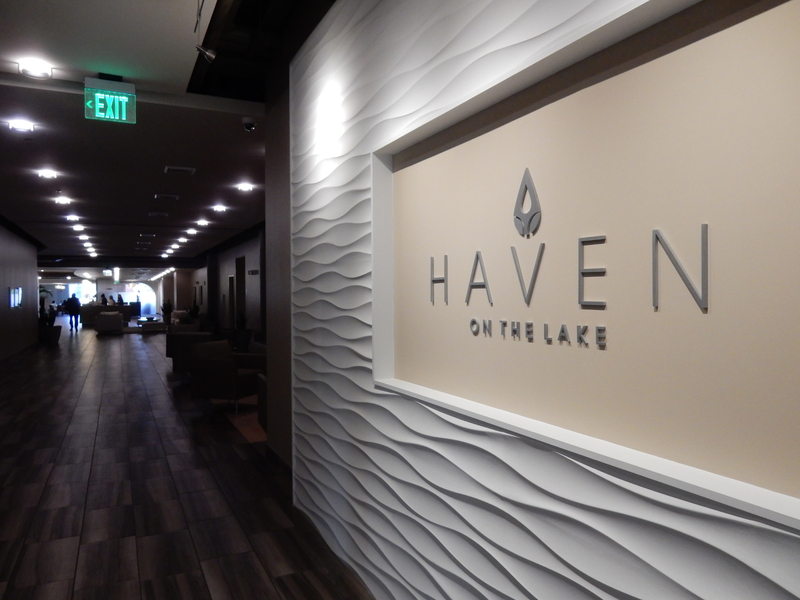 Yes, by all means, visit Haven on the Lake (downstairs from a vast Whole Foods) if you are in need of aqua-therapy, sauna, steam bath, Pilates, yoga (one specifically for cyclists! 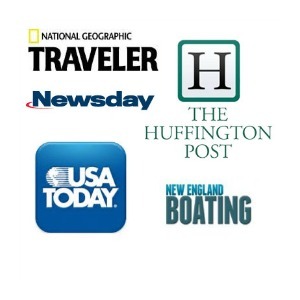 ), fitness classes or holistic spa services. But, even if you don’t plan to exercise or get a massage, come to see the building. One of Gehry’s first designs – more Frank Lloyd Wright rectangular than his signature deconstructed curves – it served as headquarters of one of the country’s first Modern Planned Communities, Columbia, MD, conceived by Howard County resident James Rouse in the early 1960’s. Rouse went on to develop Faneuil Hall in Boston, Harborplace in Baltimore and South St. Seaport in NYC among other major complexes. 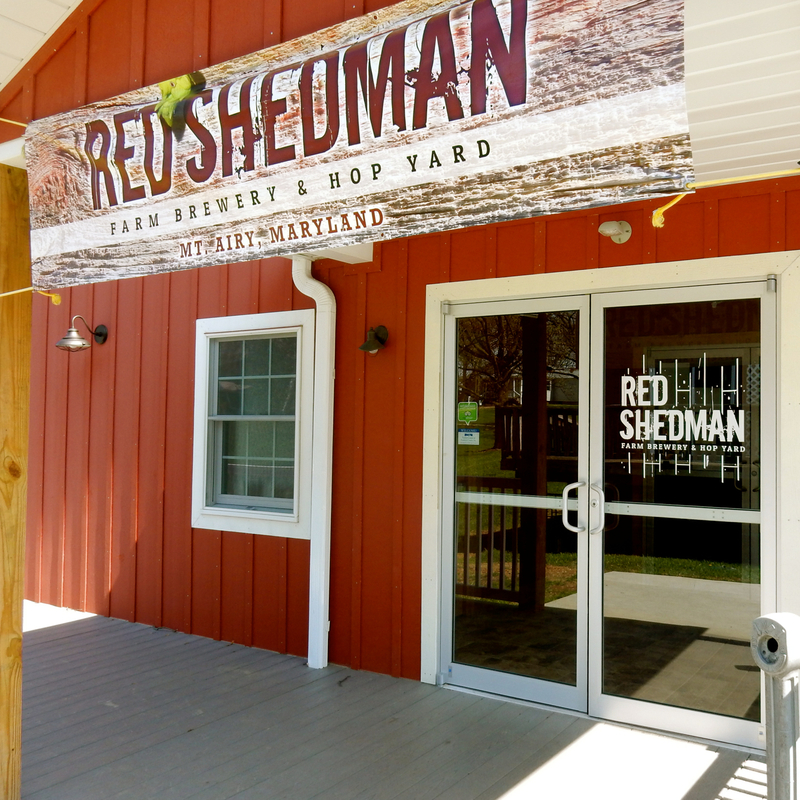 VISIT/TASTE: Linganore Cellars – Berrywine Plantation and Red Shedman Farm Brewery and Hop Yard. Mt. Airy MD. 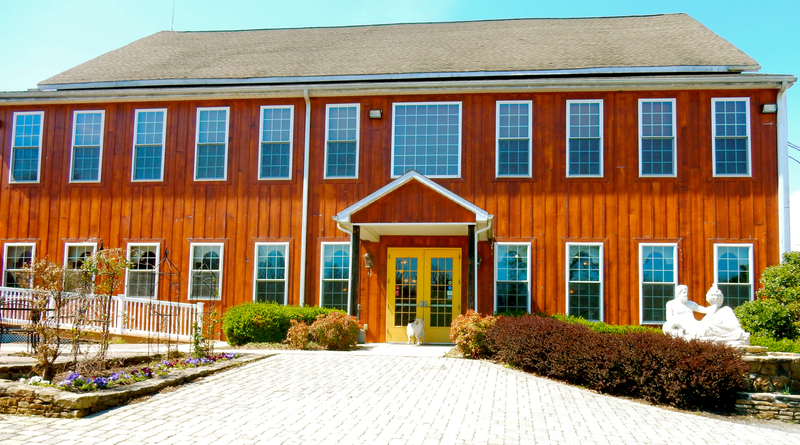 A 40 minute drive from Ellicott City, this multi-purpose facility on undulating farmland is just on the edge of Howard County and worth a drive. The vineyard of the oldest family-owned winery in Maryland slopes down to cow pastures, with wine and beer tasting rooms high on a hill. Jack Aellen and his wife, Lucille, purchased what was a 230-acre dairy farm in 1971, moved their New York family to this “strict Baptist neighborhood,” and “became instant farmers.” They soon planted their first grapevines and opened the winery to the public in 1977. “People came up but wouldn’t drink,” says their son, Anthony, who took over the operation in the early ‘80’s. “They wanted Elderberry Wine.” So, against their original intent to make sophisticated wines, Linganore Vineyard fermented 50 gallons of Elderberry Wine the first year. And 500 gallons the next. Over the years, Linganore did make those wines that the Aellen family first intended to make, and then some. Unlike many wineries that concentrate on European vinifera grapes, Linganore makes use of domestic varieties, like Cayuga, for its best selling Terrapin and other vintages. Fans of dessert wines will love the new Blackberry Kiss, a sweet but not cloying blast of fermented blackberries from Catoctin Mountain Orchard. EAT/FINE: Tersiguel’s. (Check for if/when this reopens). If you’re looking to impress someone or want to celebrate, head to this unassuming restaurant next door to the former Post Office (now the Howard County Visitor’s Center) on the top of Main Street. 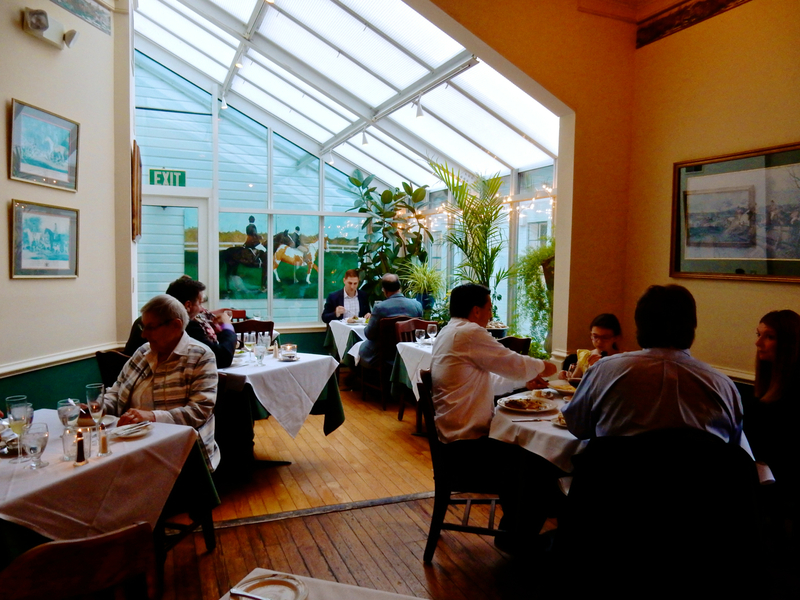 Imbued with French Country elegance, Tersiguel’s has been Ellicott City’s first choice for fine dining for 40 years. Of course, excellent cuisine is but one reason that Tersiguel’s has been in business so long. A close second is the restaurant’s Old World vibe and tableside food prep, pre-dating “open kitchens” and bringing service down to the most intimate. 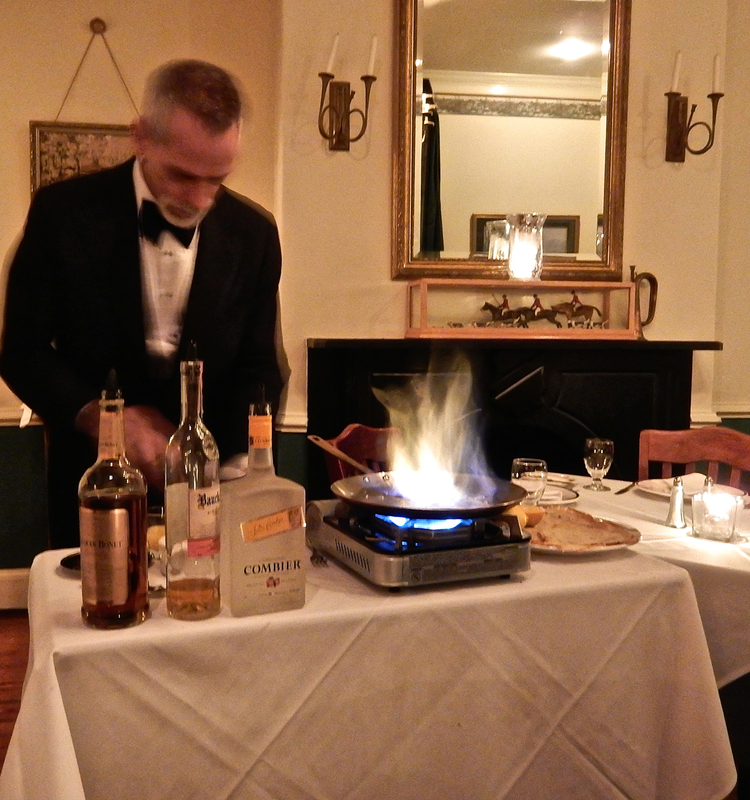 If you’re lucky, you’ll get Charlie as your waiter/tableside chef – astute in wine and Crepes Suzette (a must dessert). You can order classics like Escargot de Bourguignon ($10) and Coquille St. Jacques ($36), but unless you’re vegetarian, opt for a meat dish, which is cooked and carved tableside. And don’t forget to leave room for that Crepes Suzette. 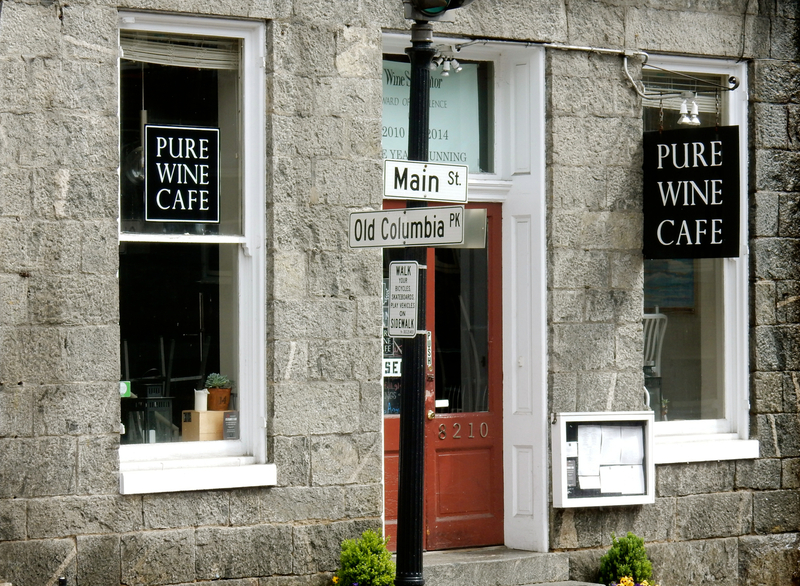 EAT: Ellicott City residents recommend Pure Wine Cafe for locally-sourced tapas. 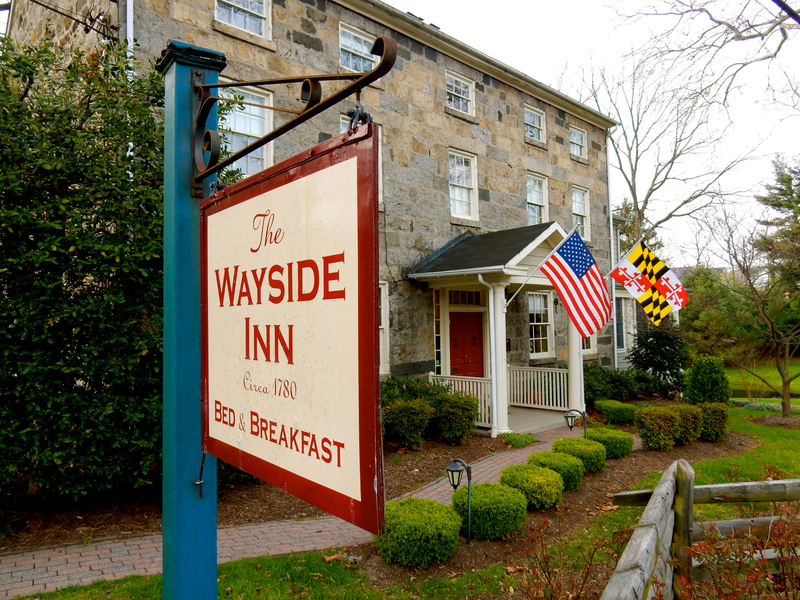 STAY: The Wayside Inn. A Maven Favorite, a complete write-up of this charming stone B&B can be found HERE. Surprised they mentioned Johnny’s Bistro. Not really worth mentioning. Ate there 1 time, and that was plenty. 2 thumbs down. So much potential for that restaurant but the owners must be asleep at the wheel…. 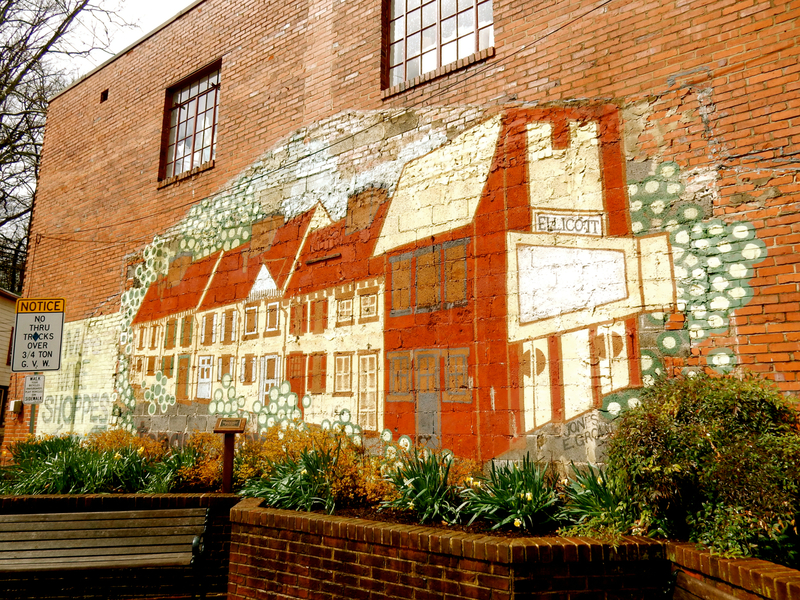 Even without our beloved Ellicott City (for the moment), there’s still lots to see and do in beautiful Howard County, Maryland. As we await the rebirth of Ellicott City, use HoCo as a base to visit several other smaller but charming Main Streets (Sykesville, Mt. Airy). Visit Savage Mill, Clarks Elioak Farm, and enjoy the miles of bike and hiking trails and park land out county offers. Thank you for this fun blog.